A substantial investment with significant return, decks increase living space during nice weather, provide a natural spot for outdoor entertaining and add value to your home. They seem rugged enough, built of sturdy, pressure-treated lumber, but even protected wood isn’t impervious to damage. Water sealer treatments help, but planters create a problem. Dampness under planters eventually seeps into the deck, which can lead to expensive repairs down the road. Planters sitting in one place are bound to collect water underneath, but periodically moving them to new spots on the deck gives wood a chance to dry out before mold and mildew has the chance to grow. Planters with drip pans don’t always help because humidity and rain seeps into the wood and can’t dry out under the pans. Large containers filled with soil and plants are too heavy to move, but wheeled planter stands make the job a bit lighter. Relocating planters once a week during rainy weather and less often when it’s hot and dry is a solution for smaller planters, especially those made from plastic. Allowing air circulation underneath planters and pots lets moisture dry before the deck wood suffers damage. This also gives some protection against stains from red clay pots. Planter feet, usually rubber, stick to the bottom of pots and planters or their drip pans and add an inch or less for circulation. Laying two or three rows of narrow, two-by-two cedar boards on the deck makes a raised platform where large planters can sit without contacting the deck. Cedar resists decay, and replacing the small boards if necessary is much simpler than replacing part of the deck. For a more stylish version, build a miniature platform deck from the cedar boards. 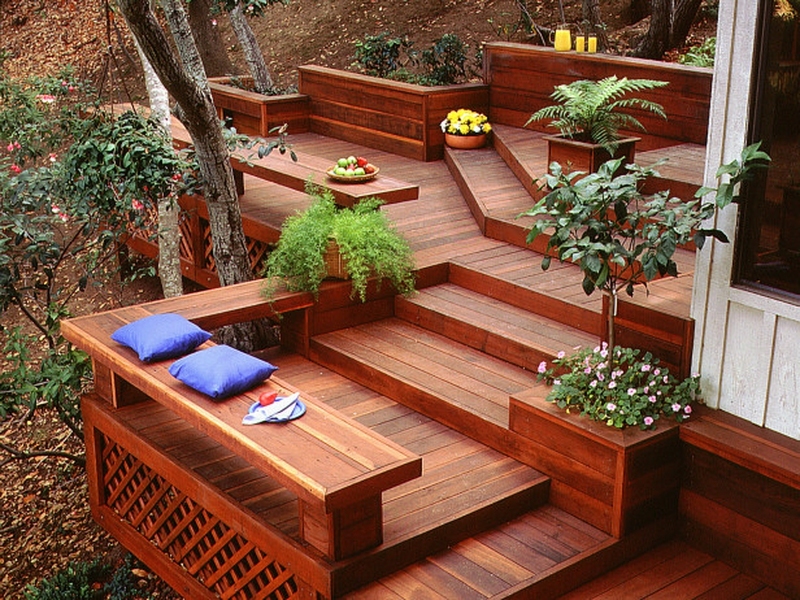 The best way to prevent planters from damaging the deck is never letting the bottoms touch the wood at all. Hanging planters, similar to window boxes, come in different varieties from oblong clay or plastic containers to wire baskets lined with moss. Heavy metal hooks wrap around the deck banister and hold planters steady against the railing. This lets you hang plants along the inside and outside of the deck railing and even off the sides of the platform. Hang more plants off the sides of steps for a bountiful garden look that won’t hurt the deck. Warm weather’s growing season isn’t the only time to guard against planter damage. Damp conditions without the benefit of warm temperatures to help dry out the deck can leave stains, mold and even moss under planters once springtime arrives. Bring delicate plants indoors where possible, and clear out containers with annuals that don’t survive winter. Removing all planters from the deck at summer’s end gives you a clean slate for seasonal maintenance. Early fall is a good time to inspect for damage and make repairs. Cleaning and sealing before winter arrives helps your deck look its best once it’s time to bring out the planters next year.